You may be familiar with bay leaves for cooking in soup and stew recipes, but did you know that it can actually be made into a potent weight-loss tea? That’s right: If you’ve been dieting to no avail or are stuck in a weight-loss plateau, it may be time to start incorporating bay leaf tea into your routine. Used historically for its antioxidant, anti-fungal, and other healing properties, bay leaf shows promise for any weight-loss endeavor for more reasons than one. And when combined with powerful cinnamon, the two make the perfect pair for a tea that will burn stubborn fat — and keep it off. In Ayurveda — the Indian sister science of yoga — bay leaf is known as a powerful healing herb for ailments like indigestion and respiratory problems. Bay leaf is a common ingredient in traditional Indian dishes, and it's also used topically to treat a variety of other ailments like dandruff and acne. In modern science, bay leaf is being recognized for its many abilities to promote good health. For example, an April 2014 study published in the journal Records of Natural Products found that both the leaf and fruit of the plant induced cancer cell death in breast cancer models, making bay leaf a promising natural cancer treatment. It also contains antioxidants like vitamin C, which help reduce free radicals in the body and improves immune system function. When it comes to weight loss, bay leaf shows promise for several reasons. First, bay leaves have anti-fungal properties that help to eliminate the overgrowth of harmful bacteria such as Candida in the gut microbiome. According to several studies, Candida overgrowth in the gut can negatively affect our metabolism and can cause weight gain, fatigue, and digestive issues. What’s more, bay leaves are also known to improve digestion by stimulating the gastrointestinal tract and promoting urination. In doing so, the enzymes in bay leaves help to decrease overall toxicity as well as improve nutrient absorption in the body. Our bodies struggle to lose weight when we are deficient in nutrients, so by increasing nutrient absorption, we can create a healthier environment within the body and optimize it for weight loss. On top of these health benefits, a January 2009 study published in the Journal of Clinical Biochemistry and Nutrition showed that bay leaves improve blood sugar levels as well as lower LDL (bad) cholesterol while improving HDL (good) cholesterol — all things that affect the bodies ability to lose weight. As we have heard many times before, cinnamon is also a potent spice for weight loss. 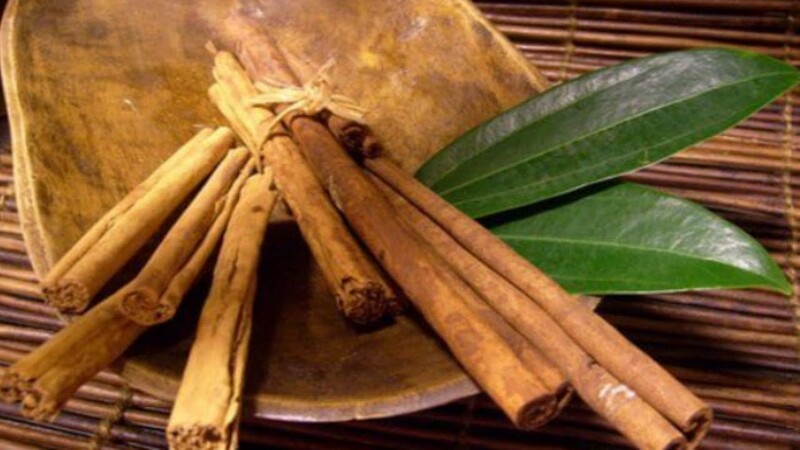 Similar to bay leaves, one 2003 study published in the journal Diabetes Care showed that cinnamon improved and stabilized fasting blood sugar and triglyceride levels — and unstable blood sugar causes us to hoard fat! Just like bay leaves, cinnamon has also been shown in studies to decrease bad cholesterol and increase good cholesterol. And what’s more, cinnamon is another powerful antioxidant. In fact, one team of researchers deemed cinnamon the second-most potent antioxidant in a group of 26 spices. Now that you’ve got the science down, it’s time to get brewing. The best part about this tea is that it requires only two ingredients aside from water, and it tastes great! You are also free to sweeten your tea to your liking using health-boosting honey or stevia. To make this healing cinnamon and bay leaf weight-loss tea, follow the easy recipe below. Add bay leaves and cinnamon to the water, and let simmer for 10 to 20 minutes. Strain, add in any desired sweeteners, and enjoy. You can save extra servings of your tea in the fridge and enjoy (cold or hot) for up to one week.